'We might as well go home, roll up our sleeves and get our guns out,' the governor says. LePage answered questions from the media briefly after a public event in the State House Hall of Flags. He talked about the importance of balancing the state budget and referred to last week’s flap over a TV screen that he put outside his office in space controlled by the Legislature. He was most animated when he spoke about the Appropriations Committee meeting of May 19. Toward the end of that meeting, LePage asked to address lawmakers but the committee’s Senate chair, Dawn Hill, D-York, denied his request, prompting the governor to walk out. On Wednesday, LePage compared Democrats’ refusal to let him address the committee to national controversies involving the Internal Revenue Service’s targeting of conservative groups, September’s terrorist attacks in Libya and the U.S. Department of Justice’s seizure of Associated Press emails. LePage also addressed his recent directive that he — not his department heads — will testify before legislative committees. 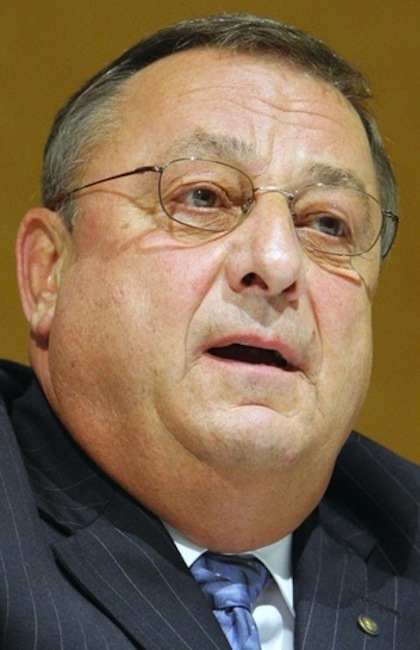 On Wednesday, LePage returned to his State House office to conduct business. The Associated Press reported that he was back at his desk, nearly a week after he vacated it in response to the dispute over the television. LePage first positioned the TV outside his office in the Hall of Flags. The Legislature’s rules prohibit people from displaying political messages in the State House without permission from the Legislative Council. David Boulter, executive director of the Legislative Council, told LePage to remove the television, prompting LePage to declare that he would move out of his State House office. He then decamped to the Blaine House to conduct business. The TV has since been installed inside his office, although it’s still visible from the Hall of Flags. It shows new messages including “No New Taxes.” No complaints have been reported.